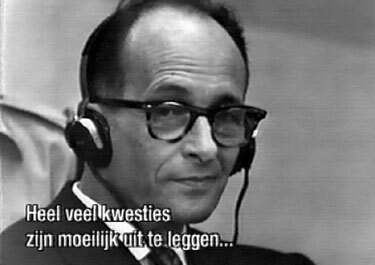 At his 1961 trial, Adolph Eichmann admitted he organized the "deportation" of Jews to concentration camps but he often requested a transfer. He thought the Jewish holocaust was unjustified and unnecessary. "Sometimes the state is involved in criminal activity but you have to obey orders," he said. "Why didn't they transfer you?" The prosecutor demanded. "I was doing a very good job. I was meticulous," Eichmann conceded. There is a lesson here. If we don't want to be complicit, let's stop being such good citizens. In our case, "doing a good job," means being apolitical and paying taxes. We have been conditioned to be spoiled, self-absorbed, trivia-minded and almost anti-social. We are not taught history, nor our rights and duties as citizens, and cannot even consider social action unless bankers, government or mass media sponsor it. We are devoted to our children but apparently indifferent to the world they will inherit. For the past week, the US has besieged a small city in Iraq, Buhrz, because soldiers in two humvees were blown up nearby. Food, water and electricity have been cut off until the residents turn over the perpetrators. No one is allowed to enter or leave. June temperatures in Iraq average 110 degrees. The residents don't know who blew up the humvees. This is a small instance of the daily oppression meted out to Iraqis who resist US occupation, paid for by your tax dollars. Well, you say. I am against the war but I have no choice but to pay my taxes. I am unaware of American atrocities because they aren't reported. Henry David Thoreau believed there was no difference between killing and paying someone else to do it. He opposed the US invasion of Mexico in 1846 and refused to pay his taxes. The famous story goes that on his first night in jail, his friend Ralph Waldo Emerson visited and said: "Henry, what are you doing in there?" Thoreau's reply: "Ralph, what are you doing out there?" Somebody (Ralph probably) paid Henry's taxes after only one night and Thoreau went huckleberry picking. But we all face the same dilemma. Are we responsible for state crimes? As you know, Prescott Bush, George W. Bush's grandfather financed the Nazi war machine. In 1992, his dad, George H.W. Bush told reporter Sarah McClendon the American public would lynch him if they knew the truth. The truth is that our so-called "leaders" belong to a vast criminal underworld that is not only corrupt and traitorous but also satanic and perverted. American democracy is a charade. As you know, the collapse of the World Trade Centre was a controlled demolition used to justify the War on Terror and domestic repression (a.k.a. Patriot Act.) The occult financial elite murdered almost 3000 ordinary Americans incl. firefighters. (Normally those buildings would not have collapsed. They also demolished nearby World Trade Center Seven on Sept 11. This 47-floor building wasn't even hit by a plane.) They spent more money investigating Clinton's affair with Monica Lewiniski than they spent investigating 9-ll. Both political parties maintain the war-on-terror hoax. How better to conquer others than to pretend we are under attack. The US public is the ultimate target of this "protection racket" surrendering its civil rights in the name of freedom. It is distracted with Paris Hilton while prepped for epidemics and possible nuclear war. It's almost Biblical; it is morally and financially complicit in its own destruction. In a recent article, "Are Ordinary Americans Responsible?" Paul Craig Roberts points to claims by a Jewish writer that ordinary Germans are responsible for the Jewish holocaust, although most didn't know about it and voted against Hitler. "Americans are complicit in the deaths and maiming of thousands of American soldiers for no valid purpose. Americans are complicit in the deaths of tens of thousands of Iraqi women and children as "collateral damage." No one knows how high the number is because the Bush administration does not regard Iraqi lives as worth counting. How much more shame and complicity will Americans allow Bush and his neocon brownshirts to shovel onto their shoulders before Americans say "enough!" and remove from office the war criminal who has sullied America's good name?" The irony is that the stubborn resistance of the Iraqi people is delaying the imposition of the New World Order. If Iraq was subdued, they could move on to Iran and Syria, and then to more repressive measures at home. "And how we burned in the camps later, thinking: What would things have been like if every Security operative, when he went out at night to make an arrest, had been uncertain whether he would return alive and had to say good-bye to his family?" We should boycott the mass media and in particular the "news." Let them know they are liars and boycott their advertisers. The important thing is to do something. John Conner, a 27-year-old salesman from San Diego has started www.theresistancemanifesto.com , a web site to encourage people to speak up. He and his friends are faxing the White House to say 9-ll was an inside job. Connor believes that the NWO agenda is to implant a chip in everyone that will prevent them from buying food or supplies unless they obey the government. This is the sign of the beast predicted in Revelations. We are taught that we live in an era somehow divorced from history and don't have to make large moral decisions as our ancestors did. The truth is we are facing a totalitarian threat similar to Nazi Germany or Bolshevik Russia. The only difference is that they try to maintain the illusion of democracy and freedom in order to deceive the masses. One author (Bertram Gross) dubbed it: "Friendly Fascism." Our generation will not escape the difficult decisions: whether to oppose tyranny or be gradually enslaved. A colleague told me that the words of two people give her courage. One a country singer said, "I may not change the world but the world won't change me." The second is Mother Theresa who said, quoting the Bible, "We are not required to succeed; we are only required to be Faithful." I need to recharge my batteries. Unless I have something urgent, I am going to take a holiday in July and August. Have a great summer!